Naples attraction-guides.com - Naples, Italy attractions guide Naples Palazzo Reale (Reale Palace) information about attractions, paintings, historic architecture, open hours, admission charges, frescoes, Charles III of Bourbon, staircase, royal apartments, Palatine Chapel, Biblioteca Nazionale, location and address details, Piazza del Plebiscito, tel / telephone number, general tourist information about Palazzo Reale in Naples (Napoli) area, Italy (Italia) IT - Last updated 30/10/2012. The Palazzo Reale (Reale Palace), in the Toledo area of Naples, is a striking example of the magnificent architecture that can be found in the historic city of Naples. 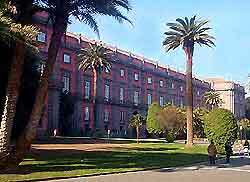 Commissioned in 1600 by Spanish viceroys and finally completed until 1843, the Palazzo Reale (Reale Palace) is an enormous building, with a complex of rooms and corridors. Over the years, Naples' Palazzo Reale has been the residence of many great Italian nobles, including the wealthy Charles III of Bourbon. Attractions at the Naples Palazzo Reale (Reale Palace) include around 30 period rooms on the first floor, many splendid frescoes and paintings, vaulted chambers, a Court Theatre built for private theatrical events, an impressive staircase leading to the royal apartments - widely believed to be the finest staircase in Europe, lavish 19th-century decoration, antique furniture, and the Palatine Chapel. Since 1925, the Naples Palazzo Reale (Reale Palace) has also been home to the Biblioteca Nazionale, which features the vast Farnese collection brought to Naples by Charles of Bourbon, containing over 2000 papyruses discovered at Herculaneum and also precious fragments of a 5th-century Coptic Bible.